... largely because Manito doubled down. Sorta. Though not really. We have tried one of their mac and cheeses before, and this time the Blackened Mac & Cheese is quite a bit different than Manito's previous Green Chili Mac & Cheese. The current incarnation is just a bit more traditional, yet different enough to be a stand-out in our minds. Frankly, they could have called it the Balanced Mac & Cheese -- the real beauty here is how the flavors work together. There is a mild smokiness pulling everything together, with just the perfect amount of spice. The second part is impressive; as both a Spiceavore and a SpiceaWARRIOR, I can take some heat, just as I can live without too many spices in my dishes, but here the spices really are perfectly balanced. It's the type of dish where you can take a bite and say, "this has a nice kick to it... and I am OK with that!" Blackened chicken can sometimes be a bit chewy, but that isn't the case here, and the bacon -- not an original addition, but welcomed all the same -- adds just a bit of salt to the palette. And as the photo below shows, that inviting top layer of cheese is well present, perfect for digging into. Like always, it's not up to us to decide if this should be The $100 Mac & Cheese Challenge winner. That's between you and Patrick; we're just the curators here. For us, this places rather high up on the list, and it goes well paired with Dogfish Head's Punkin Ale. Definitely give Blackened Mac & Cheese a try, but note that it's not on the menu. That's right, you can feel all special and in the know, ordering something from the secret menu. 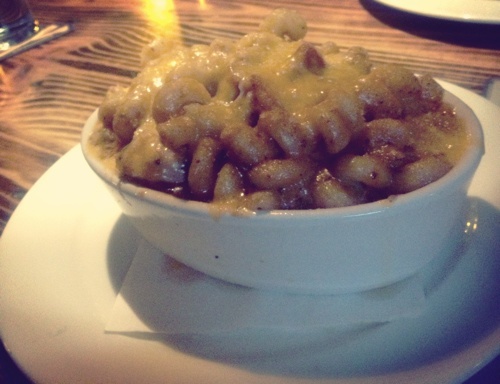 Do you recommend The $100 Mac & Cheese Challenge: Manito Tap House, take 2? Make your voice heard!